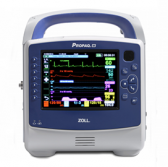 ZOLL Medical will provide deployable vital signs monitors to the U.S. Air Force and U.S. Army through a sole-source contract from the Defense Logistics Agency. Propaq M is designed to function even in austere military environments and to be configurable into the Propaq MD variant through the addition of an integrated defibrillator and pacer, ZOLL said Wednesday. The company seeks to address the military’s 12-lead electrocardiogram report and patient data printing requirements with the monitoring technology. Propaq M features Masimo‘s Rainbow Signal Extraction Technology platform that includes Masimo’s SpHb Total Hemoglobin and PVI Pleth Variability Index as well as physiologic monitoring and three integrated invasive blood pressure channels. The monitor is also built with a remote viewing tool similar to the one utilized onboard the U.S. Navy‘s USNS Comfort and USNS Mercy for humanitarian operations across the Asian Pacific, Caribbean and Central American regions. ZOLL added that the contract expands the company’s efforts to help the Defense Health Agency to equip the U.S. military with airworthy and interoperable systems designed for various operations such as medical evacuations and critical care airlift missions.